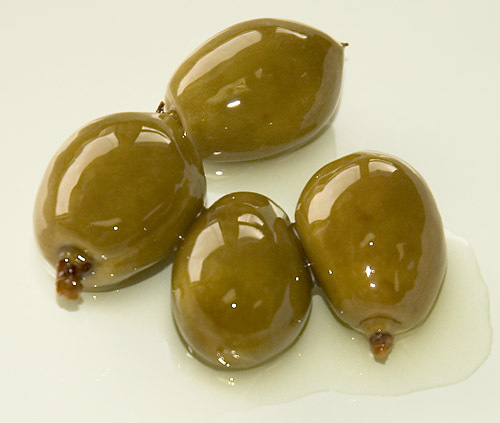 "These are the best olives I've ever had!". They were the high point of the evening for me as well. 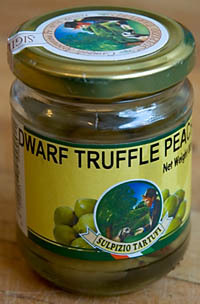 The peaches are sold by Sulpizio International, a Woodbridge, Ontario-based importer of fresh truffles, along with just about anything else you could want truffled (honey, grappa, cheese, pasta, even chocolate). Sulpizio provides a bizzare recipe on their website for Lamb with porcini, reccomending the dwarf peaches as a garnish. Quite a few restaurants use them as an accompaniment to beef carpaccio. They are crunchy and aromatic, and picked so immature that no pits have developed. We're having ours this evening with aperitifs and Serrano Ham.